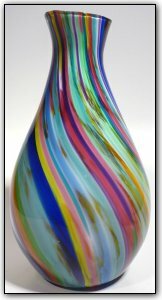 This pretty vase features many vibrant colors of the rainbow and was made from hand pulled cane. A special technique was used so inside of the canes there is a thin layer of white, helping the colors just about jump out of the glass. Working with cane is a time consuming two-stage process. First Dirwood hand pulled the canes used to make this vase, then he made this vase using those freshly pulled canes.